USB Lead. - 3 Month Warranty. The device will show signs of wear, likely being small dents to outer the body, or scratches to the screen - The device will be in perfect working condition. Debit or Credit Cards. Most issues can be resolved very quickly. Apple iPod Nano 8GB 3rd Generation - Black. Condition is Used. Dispatched with Royal Mail 1st Class. Retro ipod for sale. As you can see in the picture the screen has several lines running vertically down the screen. The back of the ipod is very scratched and the front and edges have seen better days. The play button works 90% of the time, the other 10% it just needs a firmer push for it to work. Apart form that the ipod plays fine. Comes with charger and brand new iPod headphones. Great for someone who wants to change the case or wants a cheaper ipod. 7 day auction. Apple iPod touch 2nd Generation Black (8GB). Condition is Used. 32gb iPod Touch (A1318) 3rd Generation Introduced 2009-09. No visible scratches on front screen, but there are surface scratches on silver back. An iPod Touch (3rd generation). This is in full working order and great condition, other than the silver back being scratched and worn. 32gb memory, with WiFi. Comes with the Apple plug-in unit to charge, however the USB lead for the charger is not included as it had broken - these can be purchased cheaply however. If you would like any further information or pics then please let me know. 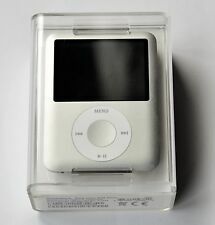 Apple Ipod 3rd Generation Nano 4gb Model A1236. works great however The click wheel forward is a little temperamental tend to skip a few tracks rather than 1 some slicker glue left on it I will try clean it off Condition is Used. Dispatched with Royal Mail 1st Class. IPod Nano 3rd Generation. Perfect as an iPod for working out due to it's size. Jack for headphones. Apple iPod touch 3rd Generation (32GB) - Fair Condition - Quick Delivery! FOR SALE: iPod Touch 3rd 32GB (Black). The iPod is a 32GB model and holds its battery well! So grab yourself a bargain! The rear also has a dent on the bottom left hand side. This may include dents/scratches/finish wearing off. 4.5 out of 5 stars - Apple iPod touch 3rd Generation (32GB) - Fair Condition - Quick Delivery! 268 product ratings268 product ratings - Apple iPod touch 3rd Generation (32GB) - Fair Condition - Quick Delivery! Apple iPod Touch 3rd Generation Black/Silver (32 GB) used but in excellent condition. Complete with Apple charging cable (but without 3-pin plug). Dispatched with Royal Mail 1st Class. Sold as seen - No headphones or box. Works perfectly. Apple iPod Nano 3rd Generation - Green, 8GB. Condition is Used, but in full working order. This iPod was once well loved and has some wear and tear marks to prove it. Some small chips on front outer edge of iPod and multiple scratches on the back from being inside a pocket. Dispatched with Ebay shutl delivery. Apple iPod Classic 3rd Generation White (40GB). Condition is Used. Dispatched with Royal Mail. Examples of which are below. This auction is for a 3rd generation iPod Nano. It’s the 4GB model in silver, and comes with the USB cable. The iPod is in good working order; the back casing is scratched as shown in the photograph. (It still has some music on it as I’m not sure how to wipe it!) Happy bidding! Ipod has been rewrite. Ipod function perfectly. It has a crack on the screen but this does not hinder the screen in use. Plus iTrip FM plug in. AppleiPod nano 3rd Generation. Including genuine data transfer/charging cable. IPod Touch. iPod Classic. iPod Shuffle. iPod Accessories. iPod Parts. We can best describe this grade as “used but in good condition and fully working order”. Product has been through a thorough screening process by our engineers and is graded as B standard. 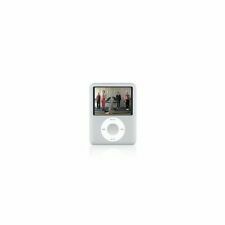 APPLE IPOD NANO 4GB A1236 3RD GEN Silver. Used but always kept in a Gear4 case. Which covered everywhere but the actual screen. As a result, the reflective rear of this ipod has very few scratches and looks in great condition, as I hope you can see from the pictures. Slighted scratched screen which is not noticeable when in use. Scratches on the reverse as is standard on this age of iPod.